Husband and wife team, Pierre and Debbie put their managerial skills and local knowledge to good use. 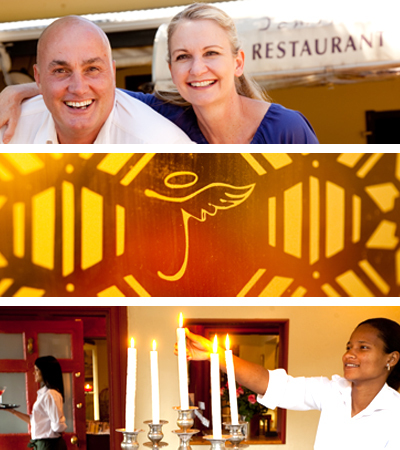 Debbie hails from Zimbabwe and Pierre is a local, having been born and brought up in Oudtshoorn. People arrive to a jovial welcome in an inviting, but unknown place and leave as old friends longing to return for another visit with friends as soon as possible. The art of turning complete strangers into long standing friends is an art perfected by our staff – effortlessly executed, truly enjoyed, altogether sincere. The Jemima’s hosts love people, not diners, friends not clients. They will discuss the fare with you, take your picture, suggest the best wine to compliment your choice of dish, laugh with you and linger out of sight to tend to your needs and wants. The traditional few paragraphs on the hosts cannot do justice to the personalities of our staff – come experience traditional hospitality where arriving strangers feel instantaneously welcome and depart as friends with a handshake and a hug, where strangers become friends in an instant that lasts forever. Unobtrusive but meticulous attention to your enjoyment is what you’ll remember long after you have reluctantly taken your leave of Jemima’s…and her people. © 2014 - 2019 Jemima's Restaurant and Holiday Rental Villas. All Rights Reserved.